15 · I Will Be a London Stage Star [Part ? of ?] · June Turner · n.
18 · The Girl Who Gave Up Luxury [Part ? of ?] · Diana Martin · n.
15 · The Girl Who Gave Up Luxury [Part ? of ?] · Diana Martin · n.
26 · I Will Be a London Stage Star [Part ? of ?] · June Turner · n.
18 · Not Wanted at Phantom Ranch [Part ? of ?] · Gail Western · n.
21 · Her Cavalier of the Caves [Part ? of ?] 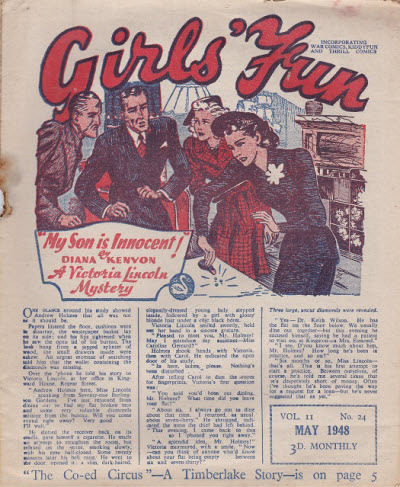 · Renee Frazer · n.
Girls Crystal and The Schoolgirl"
Title changed from Girls Crystal.